Just your average day in the U-S-of-A. And that’s when things escalated. 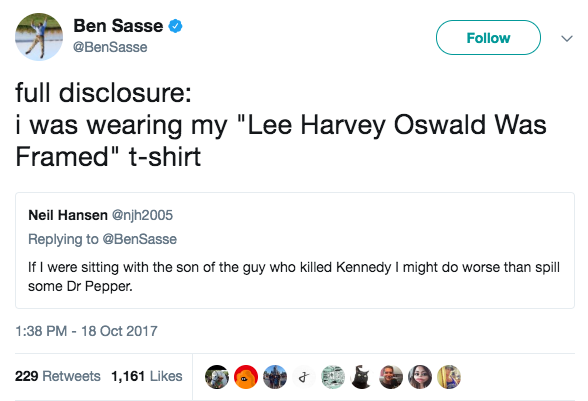 Sasse made a joke referencing a conspiracy theory, which Donald Trump promoted during the 2016 presidential campaign, that Ted Cruz’s father was involved in the JFK assassination. For those in need of a weird internet catch-up: this is the cipher of the Zodiac Killer, an unidentified serial killer who claimed to have killed 37 people in California in the '60s and '70s. There's a popular/fake conspiracy-theory-turned-meme that Ted Cruz is, in fact, the Zodiac Killer.